Top Box Drill Design is proud to present this Production Number Drill to accompany Classic Throw Down published by Jalen Publishing. Top Box Modular Drills are Easy to Teach, Fun to Learn and Thrilling to Perform. 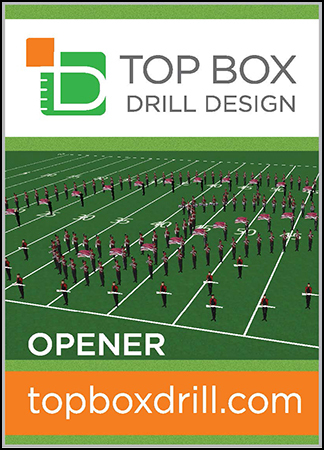 Your Drill Design is delivered along with Complete Instructions and Student Coordinate Sheets in digital file format (.pdf) accompanied by a link to a computer-animated video of the drill. An Editable Pyware Data file is available as an add-on option for use with Pyware software should a director prefer to make changes and rewrites. A contact name and email address for digital delivery is required to process the order.